VBA and Excel specifications state the limits of numbers used in the application environment. as specified in Excel VBA. 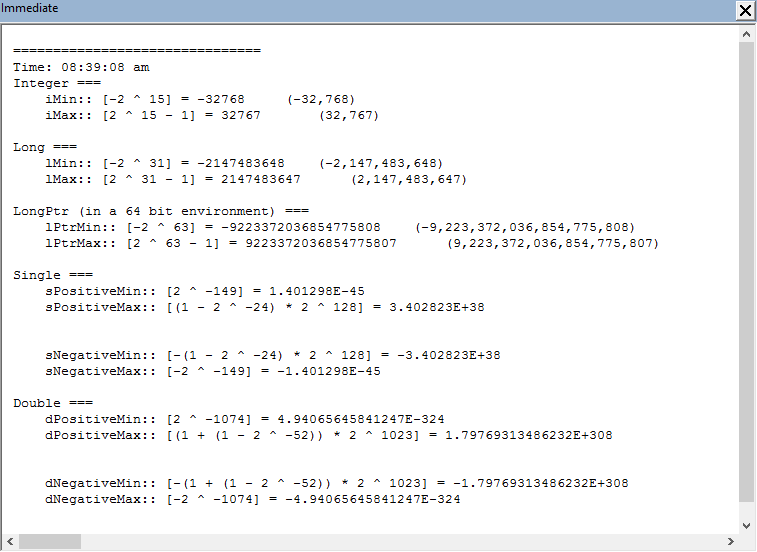 The values for double precision floating point numbers are also applicable to formulas in Excel. All formulas are binary (base 2) as depicted in code 1. Code 1: VBA number :: minimum, maximum value demonstrator. Debug.Print vbTab & "iMin:: [-2 ^ 15] = " & iMin & vbTab & "  (" & Format(iMin, "#,##0") & ")"
Debug.Print vbTab & "iMax:: [2 ^ 15 - 1] = " & iMax & vbTab & vbTab & "  (" & Format(iMax, "#,##0") & ")"
Debug.Print vbNewLine & "Long ==="
Debug.Print vbTab & "lMin:: [-2 ^ 31] = " & lMin & vbTab & "  (" & Format(lMin, "#,##0") & ")"
Debug.Print vbTab & "lMax:: [2 ^ 31 - 1] = " & lMax & vbTab & "  (" & Format(lMax, "#,##0") & ")"
Debug.Print vbNewLine & "LongPtr (in a 64 bit environment) ==="
Debug.Print vbTab & "lPtrMin:: [-2 ^ 63] = " & lPtrMin & vbTab & "  (" & Format(lPtrMin, "#,##0") & ")"
Debug.Print vbTab & "lPtrMax:: [2 ^ 63 - 1] = " & lPtrMax & vbTab & "  (" & Format(lPtrMax, "#,##0") & ")"
Debug.Print vbNewLine & "Single ==="
Debug.Print vbNewLine & "Double ==="
The output from code 1 is sent to the Immediate Window, see figure 1, and the Locals Window in figure 2. Single precision floating point numbers occupy 32 bits (4 bytes) of computer memory. The sign occupies 1 bit, the exponent 8 bits, and the fraction 23 bits. The fraction component has a maximum of 7 digits. Double precision floating point numbers occupy 64 bits (8 bytes) of computer memory. The sign occupies 1 bit, the exponent 11 bits, and the fraction 52 bits. The fraction component has a maximum of 15 digits. Development platform: Excel 2016 (Office 365 ProPlus).